Security forces have been deployed to protect the Egyptian embassy in Algiers after Egyptian businesses in the Algerian capital were attacked. The offices of Egypt Air and an Egyptian phone company were ransacked on Sunday during a rally in support of the Algerian football team. Thousands of people had gathered hoping to buy plane tickets to Sudan for the World Cup play-off match against Egypt. Wednesday's match will determine which of the sides attends South Africa 2010. The demonstration had began peacefully with a procession and shouts of "One, two, three. Go Algeria!" As tensions built, fans broke through the metal shutters of an Egypt Air branch, smashed the window and ransacked the office. The offices of telephone company Djeezy were also broken into and there were reports of a Djeezy employee being assaulted at Algiers airport. The BBC's Arab affairs analyst, Magdi Abdelhadi, says this is the first time the violence has reached such a level. Our analyst added that despite official efforts to contain the hysteria by emphasising common culture and religion, loyalty to the respective football teams appears to have the upper hand. Wednesday's sudden-death game is needed to separate the teams following Saturday's tense final group qualifier in Cairo that left the teams level on points in the qualification group. Egypt won that leg 2-0. 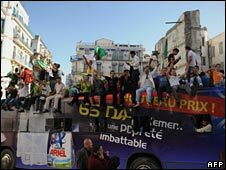 Four members of the Algerian football squad were injured on Thursday when their team bus was attacked with stones as it arrived in Cairo for the game. Following the match, around 20 Algerians were injured in clashes in and around Cairo. The teams have an intense rivalry that goes back decades. The last time they met in a major tournament in 1989, the match was followed by riots.